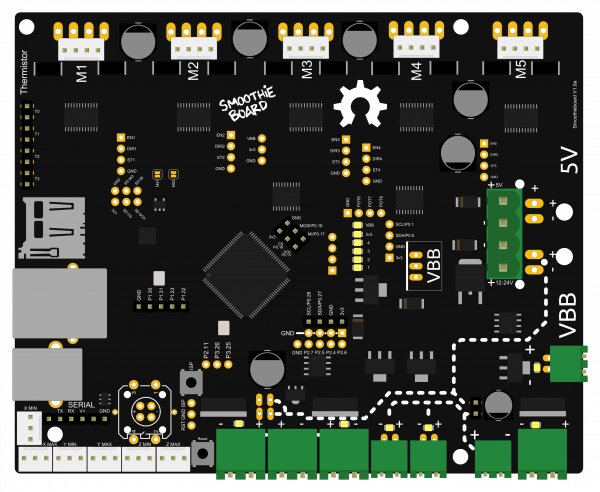 is a controller board for digital fabrication machines. It is made to be used in 3D printers, laser cutters, and CNC mills. 3XC, for laser cutters and CNC mills : has 3 stepper motor drivers and two small MOSFETs. 4XC, for 3D printers, laser cutters and CNC mills : has 4 stepper motor drivers, two small MOSFETs and two big MOSFETs, as well as Ethernet support. 5XC, for 3D printers ( including dual extruder setups ), laser cutters and CNC mills : has 5 stepper motor drivers, three small MOSFETs and three big MOSFETs, as well as Ethernet support.